The fez is one of the most recognizable symbols of Shriners International and was adopted as the Shriners’ official headgear in 1872. Named after the city of Fez, Morocco, the hat represented the Arabian theme the fraternity was founded on. It also serves as an outward symbol of one’s membership in the fraternity. 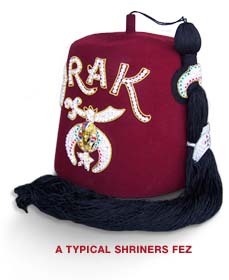 Much like the white apron worn by Masons as a symbol of their brotherhood, the fez is worn only by Shriners as a symbol of their membership in this unique fraternity. Today the fez is worn at Shriners' functions, in parades and at outings as a way of gaining exposure for the fraternity. Members customize their fez to show their allegiance to their temple. Look closely at a fez and you will also learn other important information about its wearer, such as membership in Shrine clubs, special roles within the organization and much more. Each fez is custom made and a Shriner may own more than one fez depending on his activities and memberships. 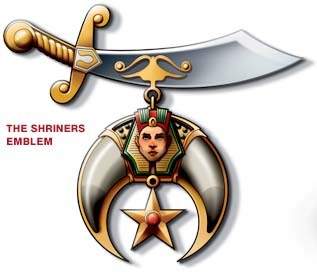 The emblem on the front of the fez, the crescent and scimitar, is an important part of the fraternity’s theme, and is representative of the characteristics embodied by the Shriners. The scimitar stands for the backbone of the fraternity, its members. The two claws are for the Shriners fraternity and its philanthropy. The sphinx stands for the governing body of the Shriners. The five-pointed star represents the thousands of children helped by the philanthropy each year. Shriner's band units and other clubs perform at parades, picnics and other events. During the early part of the 20th century membership in Shriners International grew at a steady pace. By 1946, membership had jumped to 150,000 Nobles and another 250,000 had joined by 1958. In fact, Shriners International experienced one of its largest periods of growth in the years following World War II as returning soldiers looked for new ways to continue the camaraderie they had experienced with their fellow soldiers. 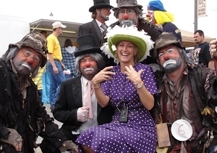 The Shrine Circus has been raising money and entertaining families for generations. As the number of temples and nobles grew, so too did the hospitals. By 1958 the hospitals’ endowment was valued at $125 million and growing. The nobles were proving themselves to be excellent fundraisers. The Shrine Circus, founded in 1906 for fun and entertainment, began to play a role as a significant fundraiser in support of the hospitals. Today, there are nearly 200 temples across North America, South America, Europe and Southeast Asia. In addition to the Shrine Circus, temples hold events throughout the year ranging from fish fries to concerts, car shows to fishing tournaments. It is fun with a purpose – supporting the important mission of Shriners Hospitals for Children®.